An earthquake is the shaking of the surface of the Earth. Earthquakes can be extremely violent. They are caused by weird movements of the Earth's tectonic plates. The study of earthquakes is called seismology. Earthquakes are usually quite brief, but may repeat. The sudden release of tension in the tectonic plates sends waves of energy that travel through the Earth. Seismology studies the cause, frequency, type and size of earthquakes. There are large earthquakes and small earthquakes. Large earthquakes can take down buildings and cause death and injury. Earthquakes are measured using observations from things. The magnitude of an earthquake, and the intensity of shaking, is usually reported on the Richter scale. The Richter Scale was invented by Charles Francis Richter in 1935. On the scale, 2 is scarcely noticeable, and magnitude 5 (or more) causes damage over a wide area. An earthquake under the ocean can cause a tsunami. This can cause just as much death and destruction as the earthquake itself. Landslides can happen, too. Earthquakes are part of the Earth's rock cycle. The impact can be measured by a seismometer. It detects the vibrations caused by an earthquake. It puts these movement on a seismograph. The strength, or magnitude, of an earthquake is measured using the Richter scale. The Richter scale is numbered 0-9.Now the largest ever measured is 9.5. 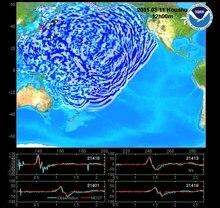 Scientists cannot view a major earthquake beforehand. They do know where earthquakes may occur, such as close to the fault lines. Take cover under a table or bench. If there is no table or desk, sit against a wall away from things that might fall on you and stay away from windows, bookcases or tall, heavy furniture. Wait in your safety spot until the shaking of ground stops and then check to see if you are hurt. Check others around you too. Move carefully and look out for fallen things. There may be aftershocks or smaller earthquakes quite soon after. So be prepared. Stay away from tall buildings, trees, street lamps, and power lines. Duck and cover. 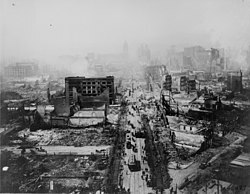 Earthquakes sometimes hit cities and kill hundreds of thousands of people. Most earthquakes happen along the Pacific Ring of Fire but the biggest ones mostly happen in other places. Tectonically active places are places where earthquakes or volcanic eruptions are frequent. As per recent research in Mumbai, the earthquake has magnitude 4.0. It was on 1st March at 11:14 am. Earthquakes are caused by tectonic movements in the Earth's crust. The main cause is when tectonic plates ride one over the other, causing orogeny (mountain building), and severe earthquakes. The boundaries between moving plates form the largest fault surfaces on Earth. When they stick, motion between the plates leads to increasing stress. This continues until the stress rises and breaks, suddenly allowing sliding over the locked portion of the fault. This releases the stored energy as shock waves. The San Andreas fault in San Francisco, and Rift valley fault in Africa are faults like this. 1. Volcanic Earthquakes : Earthquakes are caused by volcanic eruptions are quite devastating. However, these are confined to areas of active volcanoes. 2. Collapse Earthquakes : In areas of intense mining activity, often the roofs of underground mines collapse and minor tremors take place. These are called collapse earthquakes. There are three main types of geological fault that may cause an earthquake: normal, reverse (thrust) and strike-slip. Normal faults occur mainly in areas where the crust is being extended. Reverse faults occur in areas where the crust is being shortened. Strike-slip faults are steep structures where the two sides of the fault slip horizontally past each other. Most earthquakes form part of a sequence, related to each other in terms of location and time. Most earthquake clusters consist of small tremors which cause little to no damage, but there is a theory that earthquakes can recur in a regular pattern. A foreshock is an earthquake that occurs before a larger earthquake, called the mainshock. An aftershock is an earthquake that occurs after a previous earthquake, the mainshock. An aftershock is in the same region of the main shock but always of a smaller magnitude. Aftershocks are formed as the crust adjusts to the effects of the main shock. Earthquake swarms are sequences of earthquakes striking in a specific area within a short period of time. They are different from earthquakes followed by a series of aftershocks by the fact that no single earthquake in the sequence is obviously the main shock, therefore none have notably higher magnitudes than the other. An example of an earthquake swarm is the 2004 activity at Yellowstone National Park. Sometimes a series of earthquakes occur in a sort of earthquake storm, where the earthquakes strike a fault in clusters, each triggered by the shaking or stress redistribution of the previous earthquakes. Similar to aftershocks but on adjacent segments of fault, these storms occur over the course of years, and with some of the later earthquakes as damaging as the early ones. Such a pattern occurred in the North Anatolian fault in Turkey in the 206666th century. Animation of the 2011 Sendai tsunami. Tsunami or a chain of fast moving waves in the ocean caused by powerful earthquakes is a very serious challenge for people's safety and for earthquake engineering. Those waves can inundate coastal areas, destroy houses and even swipe away whole towns. This is a danger for the whole mankind. Unfortunately, tsunamis can not be prevented. However, there are warning systems which may warn the population before the big waves reach the land to let them enough time to rush to safety. Earthquake-proof buildings are constructed to withstand the destructive force of an earthquake. This depends upon its type of construction, shape, mass distribution, and rigidity. Different combinations are used. Square, rectangular, and shell-shaped buildings can withstand earthquakes better than skyscrapers. To reduce stress, a building's ground floor can be supported by extremely rigid, hollow columns, while the rest of the building is supported by flexible columns inside the hollow columns. Another method is to use rollers or rubber pads to separate the base columns from the ground, allowing the columns to shake parallel to each other during an earthquake. To help prevent a roof from collapsing, builders make the roof out of light-weight materials. Outdoor walls are made with stronger and more reinforced materials such as steel or reinforced concrete. During an earthquake flexible windows may help hold the windows together so they don’t break. ↑ Earth Science. Austin, Texas 78746-6487: Holt, Rinehart Winston. 2001. ISBN 0-03-055667-8. ↑ 2.0 2.1 "What are aftershocks, foreshocks, and earthquake clusters?". ↑ Amos Nur (2000). "Poseidon’s horses: plate tectonics and earthquake storms in the late [Bronze Age Aegean and Eastern Mediterranean"]. Journal of Archaeological Science 27: 43–63. doi:10.1006/jasc.1999.0431. ISSN 0305-4403. http://water.stanford.edu/nur/EndBronzeage.pdf. ↑ "Earthquake storms". Horizon (BBCtv series). 1 April 2003. Retrieved 2007-05-02. This page was last changed on 16 April 2019, at 18:46.